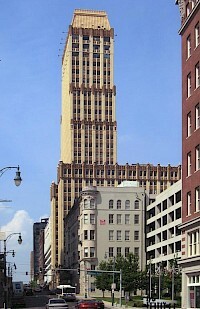 100 North Main currently stands as the tallest building in Memphis, Tennessee. At 430 feet, (131m) it serves as 37 floors of office space. The building currently stands bordering Adams Street, North Second Street, and North Main. Finished in 1965, 100 North Main has remained a focal point of the Memphis riverfront skyline. This article is about an office building in Memphis, Tennessee. For information about the castle-like structure in Winterset, Iowa, see Clark Tower Clark Tower is a 34-story high-rise office building in eastern Memphis, Tennessee. It was completed in 1972. The building is owned and managed by In-Rel Management. Clark Tower was developed in the early 1970s by developer William B. Clark, Sr. as part of a larger development called Clark Center. The Lincoln American Tower is a 22 story building located at the corner of North Main and Court streets in Memphis, Tennessee. It is also a historical landmark, one of the first steel frame skyscrapers built in Memphis. 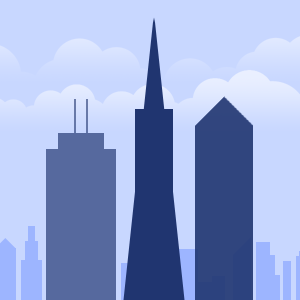 The tower underwent a six year refurbishing project starting in 2002, and despite a fire in 2006, is now open and accepting tenants. One Beale is a proposed high rise hotel, condominium and office building in Memphis, Tennessee. It is expected that construction will begin in mid 2008 and end in 2010. In December 2005, Gene Carlisle proposed a building at Beale Street and Riverside Drive in Downtown Memphis. The first phase of One Beale was a $150 million dollar, 27 story condominium and hotel standing at 313 ft (95 m) tall. The tower was to feature 168 hotel rooms and 159 condos. The Sterick Building is an office building in Memphis, Tennessee. It was designed by Wyatt C. Hedrick & Co., and was completed in 1930—its name is a contraction of the original owners' names R.E. Sterling and Wyatt Hedrick. It is a gothic-style tower, 111 m (365 ft) tall with 29 floors. 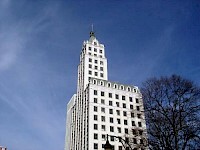 When it opened it 1930 it was the tallest building in the South and was the tallest building in Tennessee until 1957. It is now the fifth-tallest building in Memphis.